Our newest product! If you are concerned because you have never tried seaweed before ~ or you just love flavorful snacks ~ this is the one to try! For Dulse lovers whom would like a smoky flavor! Our cold smoked dulse is for you! Nutritious and delicious! Our dulse seaweed is harvested from Maine's pristine waters. The color is a beautiful deep pink rose, that dries to a deep wine red. This red seaweed is packed with nutrients that are essential for everyday life, and all sea vegetables are a good source of iodine. 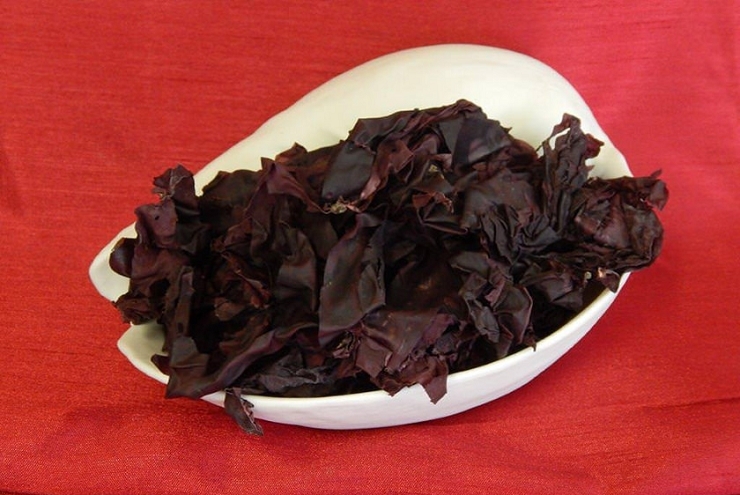 Dulse seaweed has a spicy flavor and is soft and chewy with a unique taste and a rich red color. It doesn't require any soaking or cooking. Use raw, dried, toasted, smoked, fried, or baked. Cooks in 5 minutes (use sesame oil) to make feather-light and crispy. Add dulse to sandwiches, omelets, sauces, and gravies. Also add to dressings, salads, soups and chowders, vegetables, potatoes, bean and rice dishes, breads, casseroles and cheeses! For snacking: pan-fry and eat as a 'chip' or try our 'Pink Salt' (dulse mixed with sea salt), which is excellent on popcorn!